Neita Coleman’s 4-year-old home is not unlike many others recently built in metro Augusta. Her two-story traditional has a well-landscaped yard, energy-efficient windows and all the middle-class comforts one would expect in a modern abode, from high ceilings and hardwood floors to stainless steel appliances and granite counter tops. The only thing unusual is that the home sits in one of the city’s oldest and most abandoned neighborhoods: Laney-Walker/Bethlehem. But new housing could be a more common sight in Laney-Walker and other inner-city neighborhoods if community leaders can get a new generation of homeowners to look past the blight and invest in areas that others have fled. Coleman chose downtown to be close to her city job and get in on the ground floor of what she believes is the renaissance of the historic African-American neighborhood just east of Augusta University’s booming downtown medical campus. “I saw it as an opportunity to actually help bring the neighborhood back to what some people would say is the golden years,” she said. Her house is one of the roughly two-dozen $130,000 to $200,000 homes built during the past five years in the Heritage Pine section just south of Laney-Walker Boulevard between 11th and 12th streets. The development is one of several city-financed housing projects to spring from the Laney-Walker/Bethlehem Revitalization Initiative, a master plan that in 2013 won the U.S. Housing and Urban Development secretary’s Opportunity and Empowerment Award. With a goal of getting 10,000 new residents living in the 1,100-acre historic district – where more than 70 percent of homes are dilapidated and one in four are vacant – the plan is by far the region’s most ambitious urban renewal proposal. And it’s the only one receiving major public support in the form of a $1 hotel-motel tax, which funnels more than $750,000 a year toward redevelopment work in the district. Hawthorne Welcher Jr., the director of Augusta’s Housing and Development Office, said other Laney-Walker projects coming up for approval this year include Foundry Place, a mixed-use proposal in an industrial neighborhood bordered by R.A. Dent, Wrightsboro Road and Augusta Avenue. There also is East Mill Village, a cluster of single-family homes and duplexes near Wrightsboro Road and 12th Street, and Holley Street Commons, a single-family neighborhood east of R.A. Dent between Laney-Walker Boulevard and Wrightsboro Road. In all, the revitalization effort intends to offset decades of population decline and disinvestment. THE LANEY-WALKER/BETHLEHEM PLAN isn’t the only initiative that seeks to repopulate Augusta’s urban core. On the other side of the medical district, in the shadows of the city’s idle textile mills, volunteers with the nonprofit Turn Back The Block are helping renovate abandoned and dilapidated shotgun houses in the historic Harrisburg neighborhood for new owner-occupants. “We really feel like home ownership is going to be the axis for the turnaround,” said Christel Jiles, Turn Back The Block’s executive director, adding that renter-occupied homes are three times more prevalent in Harrisburg than the average neighborhood. Since the group’s creation in 2010, it has acquired and renovated eight dilapidated homes using donated labor and building materials. Rather than targeting homes piecemeal, the group concentrates on rehabilitating entire blocks. “Our eventual goal is to see the renovation of the entire Harrisburg neighborhood,” Jiles said. East of Harrisburg, in the city’s central business district, community leaders have been spit-balling ideas to redevelop underused Broad Street buildings into apartments and mixed-use space. Further east, in the historic Olde Town district, pockets of unconnected real estate investors are renovating turn-of-the-century homes for young families, college students and professionals. 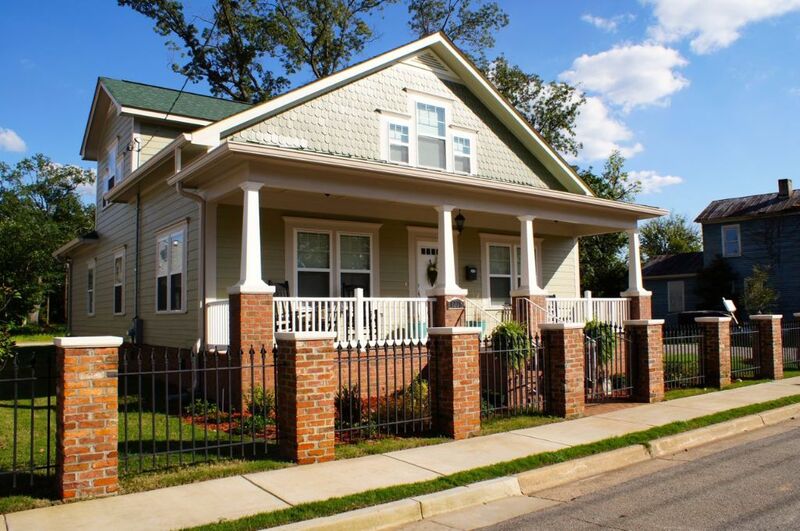 Augusta-based contractor RAM Construction recently finished the first all-new home in Olde Town in decades. The common thread to these disparate initiatives is their appeal to the fastest growing groups of urbanites: young professionals and adventurous empty nesters. THE REVITALIZATION EFFORTS going on in parts of urban Augusta are a microcosm of what’s happening in cities all across America as younger generations of homeowners wait longer to get married and have children – two life events that traditionally trigger a move to the suburbs. America’s suburbs have for decades grown faster than urban areas, though cities have narrowed the gap in recent years. And one year – 2011 – growth in cities actually outpaced the suburbs. U.S. census data released earlier this year show urban counties grew only two-tenths of a percent slower than suburban counties did in 2015. Richmond County, the metro area’s most urbanized area, grew a negligible four-tenths of a percent from 2000 to 2010, according to census figures. The county also has historically lagged in new construction permits for new single-family homes compared with Aiken and Columbia counties. With rural and suburban parcels becoming increasingly rare, developers in Richmond County speculate an increase in “infill” developments, such as the Guardhouse Square luxury town-homes being built outside the gates of Augusta University’s Summerville campus. There, a local investment group demolished a former day care building at 2401 Walton Way and subdivided the property into four, $125,000 town-home lots – all of which sold within six months. “There was no shortage of interest on that property,” said Dennis Trotter, a partner in Guardhouse Townhouses LLC. URBAN LIVING ISN’T FOR EVERYONE, but it appears to work well for young, single professionals such as Cole­man, who is less than five minutes from her job. She enjoys the manageable size of her small yard and the fact that her home is nearly three times bigger than the condominium she used to own in Summerville. What cinched the deal was finding out about attractive incentives – including down-payment assistance and reduced property tax rates – available for homes in the enterprise zone. Developers of the neighborhood took care to ensure the new homes weren’t architecturally out of character with the existing ones. The Heritage Pine homeowners association, where Coleman serves as president, requires residents adhere to neighborhood standards that forbid, among other things, putting up metal tool sheds, parking cars in yards and making any changes to the homes’ neo-traditional facade. Meybohm’s Hutcheson said millennial-driven urban revitalization efforts seem to be the most prevalent in Olde Town. THE INFLUX OF UPWARDLY MOBILE professionals and improvements in community-based policing practices have lowered crime rates in urban neighborhoods nationwide, though city centers still have a reputation among suburbanites as being unsafe. Statistics in Augusta do not bear that out, at least not in Laney-Walker, where a city report last year showed the vast majority of crime in the district – 78 percent – involved drug offenses and nonviolent property crimes, such as trespassing and larceny. Coleman said she believes her neighborhood is no more or less dangerous than any other in the city. Hutcheson said sales in Heritage Pine and Twiggs Circle have exceeded expectations, but she acknowledged the developments are being built at a much slower pace than suburban subdivisions, which can see 10 new rooftops a month compared with the six built last year in Laney-Walker. Coleman said a handful of longtime Laney-Walker residents have groused about new construction and the influx of professionals in the historically working-class neighborhood, but most old-timers she encounters are happy to see new signs of life. Developers of the upscale Hammond’s Ferry subdivision in North Augusta continue building a “new urbanest” community that borrows heavily from neighborhoods just across the river in Augusta’s urban core. The old-is-new concept has helped make the community one of the region’s biggest real estate success stories. The 300-home development is roughly halfway built out, with most homes getting sold before they are completed, Greene said.